Sidecar Doughnuts & Coffee will celebrate National Doughnut Day on Friday, June 1. They will also be launching new June flavors – including one designed by another 2018 Sidecar Chef Series chef – and will a kick-off a month full of exciting collaborations. Chef Michael Fiorelli of Manhattan Beach's designed a flavor called 'Love & Salt,’ which is a play on the restaurant's cult-favorite dessert, Brown Sugar Pudding. The doughnut version is a brown sugar cake doughnut, topped with salty brown sugar pudding glaze, and finished with cocoa nibs and Maldon Sea Salt. A portion of all proceeds from this flavor will go to, Chef Fiorelli’s charity of choice. The June flavor specials are inspired by the tropics and include Piña Colada, Love & Salt, Tropical Sunrise, and Key Lime Pie. Key Lime Pie will be offered at Sidecar’s Costa Mesa flagship location only, -. This June, Sidecar will participate in Imbibe Magazine's, June 4th – 10th with a special Negroni-inspired flavor, Blood Orange Negroni. The doughnut is Sidecar's signature raised bullseye, topped with a gin-orange glaze, blood orange curd, a dollop of vermouth whipped cream and a drizzle of a house made Negroni reduction. The Blood Orange Negroni will be offered at Sidecar's Costa Mesa flagship location during Negroni Week only. 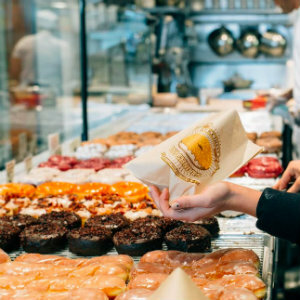 Sidecar Doughnuts & Coffee is located at 270 E. 17th Street, Costa Mesa, and 631 Wilshire Blvd., in Santa Monica.